In the glorious Middle Ages, St. Anne was fondly called: Comfortress of the Sorrowing-----Mother of the Poor-----Health of the Sick-----Patroness of the Childless-----Help of the Pregnant-----Model of Married Women and Mothers-----Protectress of Widows-----Patroness of Laborers. Comfortress of the Sorrowing. St. Anne was spared neither trials nor bitterness. God tested her severely, especially by ordaining that she would have to wait so long for Mary, her child of predilection. For years, hidden sorrow was her daily bread. Mother of the Poor. St. Anne's love for the poor is evident from the praise bestowed upon her by St. John Damascene, who relates that she and St. Joachim distributed one third of their possessions to the poor. St. Anne still continues her charity in Heaven by assisting the poor, often in a wonderful manner. Nor does St. Anne forget the dying, the poorest of the poor. These, above all others, experience her motherly protection. Health of the Sick. The number of cures wrought through the intercession of St. Anne is countless. Day after day the churches dedicated to her, as that at St. Anne de Beaupré, have resounded with the suppliant voices of her clients. Sight has been restored to the blind, hearing to the deaf, soundness to the bodies of the infirm and crippled. These are the exterior signs of the power and maternal goodness of St. Anne, but what shall we say of the interior cures of spiritual ailments known to God alone? How many times has the good Saint strengthened a wavering courage, given a new vitality to a languid spiritual life, opened a mind to the light of the true Faith? Numberless prodigies of this kind have taken place at the Shrine of St. Anne, unknown to men for the most part, but known to God, whose loving Providence seems to take delight in granting multiplied graces through the intercession of good St. Anne, so that the ex votos, the mute testimonies of innumerable physical cures, could well be supplemented by testimonials of spiritual favors, were such a thing possible. 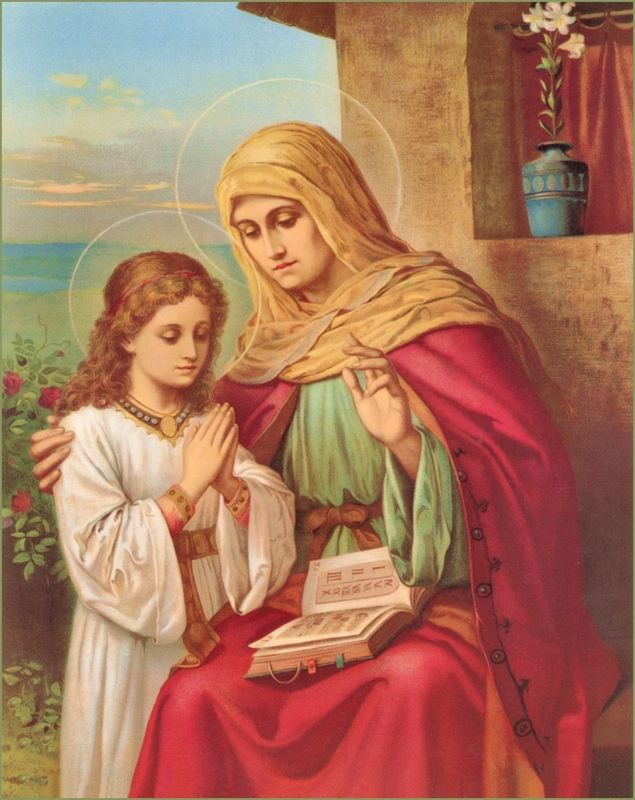 Good St. Anne, like a true and faithful mother, does not turn a deaf ear to the pleas of her children; and as a mother's heart is deeply touched at the sight of the afflictions of her children, so is St. Anne's motherly heart touched by the petitions of those who come to her seeking solace and comfort. Patroness of the Childless. Childless mothers invoke good St. Anne because, only after many years of married life, did this Saint finally receive from God the child of grace, Mary. Full of compassion for those in like sorrow, she intercedes with God and, if it be His holy will, obtains for them the favor which completes the happiness of conjugal union. Help of the Pregnant. This office of good St. Anne is connected with the foregoing. As she obtains for women the much-desired favor of motherhood, so she will also guard the fruit of the womb, so that the child may receive holy Baptism. She assists mothers when they are in their great anxiety, and she obtains a happy delivery. Model of Married Women and Mothers. St. Anne is the shining example of all Christian women. This was her vocation on earth as wife of St. Joachim and mother of the Blessed Virgin. She is, indeed, the patroness of Christian women and mothers, their special protectress and advocate, having herself borne the heavy burdens of the married state and tasted all the bitterness which makes this vocation difficult. In every family where good St. Anne is invoked, she shows herself a loving protectress, and never has she been venerated or invoked in vain. She obtains for women, particularly in our misguided age, the light to understand the high purpose of Matrimony. God instituted this Sacrament for the propagation of mankind. Since the Fall, the state of Matrimony is, especially for the wife, a state of penance, of labor, of submission. But although children are often a source of much trouble and care to parents, particularly to the mother, they are, nevertheless, to be regarded as a blessing, "the blessing of children," for they are a gift of God, a pledge of His Fatherly goodness. This is the sublime, the sacred purpose of Matrimony: to bring forth children who will be children of God, heirs of Heaven, who are destined to possess forever the places of the Fallen Angels! The hope of the Church is in good Christian mothers; their sons and daughters will fill the sanctuaries and convents. Protectress of Widows. Difficult is the state of the Christian widow. Bereft of her husband, her staff and the support of her children, she stands alone in the world-----if poor, doubly needy. Is it any wonder, then, that Holy Scripture, after recommending to our charity the poor and orphans, also begs our compassion for widows? Their patroness, good St. Anne, will lovingly shield and protect them in their many dangers and temptations, both spiritual and temporal. Hence, Christian widows feel drawn to place themselves under her powerful protection. Patroness of Laborers. Among the various classes of laborers, many regard St. Anne as their special protectress. But it is very significant that Christian sculptors venerate her as their model. They have chosen as their emblem the image of St. Anne teaching the child Mary, with these words inscribed beneath: "Thus she wrought the Tabernacle of God." For every Christian sculptor, the Tabernacle, the dwelling of God, is in a certain sense the masterpiece of his art. Nihil Obstat: William J. Blacet, J.C.L. Imprimatur: +J. John P. Cody, S.T.D. Originally published by the Benedictine Convent of Perpetual Adoration, Clyde, Missouri in 1958. Revised edition published in 1963. Retypeset and re-published by TAN Books and Publishers, Inc. in 1998. Updates and additions made to information on shrines by the Publisher, 1998. The depiction of Saint Anne in art, both in traditional [or popular] and masterpiece works are found in one of four themes: meeting Saint Joachim at the Golden Gate after his expulsion from the temple because the couple was childless; Saint Anne visited by the Angel Gabriel to announce that she will bear a child at last and or the birth of the Virgin herself; the presentation of the Virgin to the temple and or the education of the Virgin; and the Saint with the Virgin and Child, either alone or with Saint Joachim and sometimes other Saints. The most portrayed are the birth of the Virgin, her education, and with Madonnas and Saints. One of the Saints is St. John the Baptist, the precursor to Christ. One tends to think of him in imagery with his mother, St. Elizabeth, instead, one of the most frequent of art themes. There is an interesting aspect to the Madonna images: sometimes the Virgin Mary, is positioned in such proportion that she appears as a very young girl at her mother's side while Saint Anne holds the Infant Christ. This was particularly so before the Baroque period, emphasizing Saint Anne's importance in Mary's life as the Mother of the Savior. In fact this theme can be thought of as an extension of the education of the Virgin. Saint Anne has two colors, red and green, one for love, the other for rebirth, as she bore the New Eve, Mary. No artist is bound to paint the mother of Mary wearing these two colors, and a number of holy cards do not do so, but it is more often the case that Saint Anne is seen with one or both of these colors in her robes. Like the Virgin Mary she usually has a white lily for purity in the scene and often roses, too, again a parallel with the Virgin. The other symbol is an open book because it is she who steeped the Mother of God in the holy mysteries. The poster image used for this chapter is a perfect example. The poster print [8 x 11] is available for purchase at All Posters on the web: when you arrive there, copy and paste the following number, 250454 into the search box and click the arrow button --- this will bring you to page where it is displayed for purchase. The image can also be sent e-mail as a postcard. One of the most interesting images is the Beaupré St. Anne, wherein she is adorned with a crown like the Virgin Mary. In this image red and green is visible, with the red a very pale hue in the robe itself, but vibrant in the ruby gems of the crowns. This image is revered by the French in Quebec and those with a devotion to St. Anne de Beaupré.